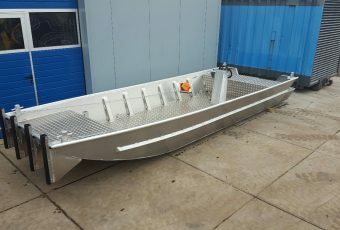 Hasekamp Trading Holland has his own production line of new aluminium workboats and landing craft, fully designed and fabricated in the Netherlands with a CE Marking. These aluminium workboats are designed to be very reliable, stabile and above all: they last for years and keep their value. 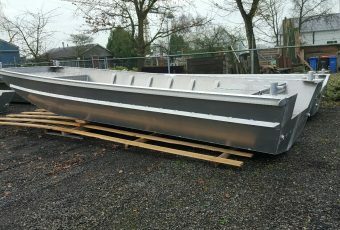 All our offered boats are in stock, so without any delays you can have your boat within one week time. HasCraft 600 with V-bottom, this boat can be used when speed is necessary in your work and it can take more waves than a flat bottom boat, engines up to 150 HP are possible . Inside dimensions are the same as the flat bottom boat . all extras available upon request.! The HasCraft 600 Pushboat is designed for pushing and towing pontoons and all sorts of floating plant . With the steering and seating in the rear of the boat you still have a lot of space left to carry your equipment. 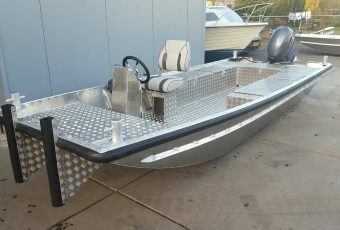 equipped with a set of 500 kg manual coupling winches and the necessary horsepower this boat will do the job in no time.! The HasCraft 500 People carrier will bring your crew from shore to shore and will even take their equipment from A to B and beyond, free of maintenance , easy to transport and no wet feet on Monday morning with the self drained deck. 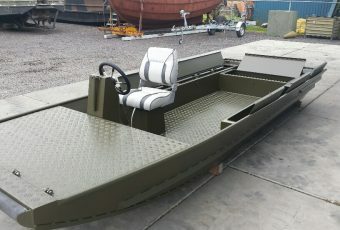 This HasCraft 500 Multipurpose has it all in the name, a multipurpose workboat designed to perform all your daily work on rivers , lakes and even shore zones. With the extra storage and seating capacity the boat can bring your crew to their workplatform and perform all surrounding works. 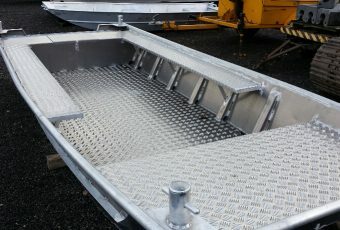 This HasCraft 500 Pushboat is designed for pushing and towing pontoons and all sorts of floating plant . With the steering and seating in the front of the boat you are able to have a full view at your work. 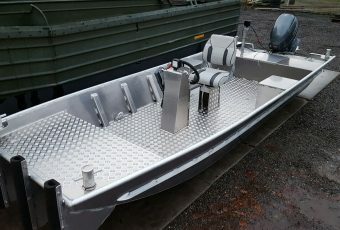 equipped with a set of 500 kg manual coupling winches and the necessary horsepower this boat will do the job in no time.! The HasCraft ZL450 Hunter / Fisher is designed for the government and is being used for pest controls, water research and fish quality checks , this boat can be trailered 5 to 10 times per day in their jobs and is very heavy build for the use in shallow waters.